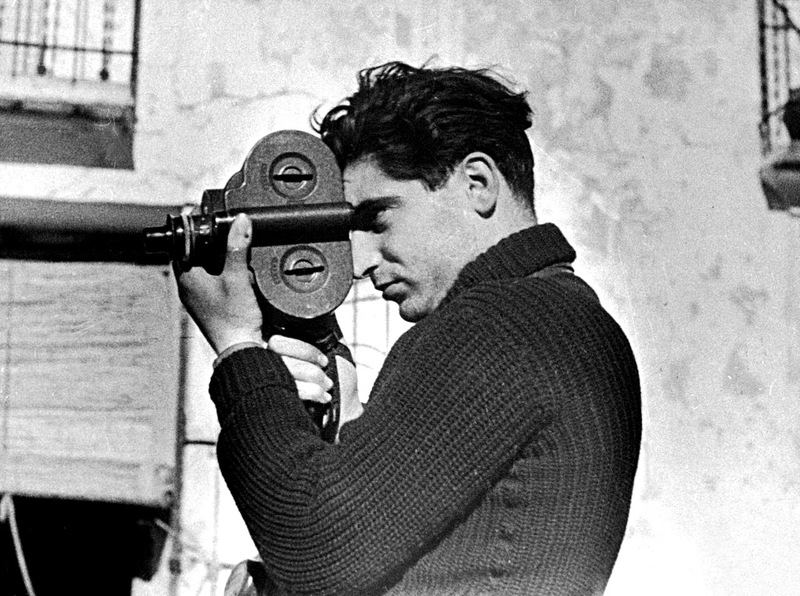 Robert Capa was a Hungarian war photographer and photojournalist. His repertoire of work include his coverage of five wars: the Spanish Civil War, the Second Sino-Japanese War, World War II across Europe, the 1948 Arab-Israeli War and the First Indochina War. His photography has curated images from World War II in London, North Africa, Italy, the Battle of Normandy on Omaha Beach and the liberation of Paris. With dreams of being a writer at first, Robert Capa found work in photography in Berlin and began to take to the art form like fish to waters. With the rise of Nazism in Germany, he moved to France to escape persecution of Jewish journalists and photographers, and concealed his Jewish name – Endre Friedmann, and became Robert Capa. His first published photograph was of Leon Trotsky during his speech in Copenhagen on “The Meaning of the Russian Revolution” in 1932. From 1936 until 1939, Robert Capa worked in Spain, and captured moments from the Spanish Civil War along with Gerda Taro, his companion and professional photography partner and David Seymour. His work, “Falling Soldier” catapulted him to fame in 1936. He had taken the photograph in Cerro Muriano on the Cordoba Front, and is generally assumed to be a picture of a militiaman from the Workers’ Party of Marxist Unification, although there are varying interpretations of the identity of the subject. When World War II began, Capa was in New York after having moved from Paris in the hope of finding work, and to escape the rising Nazi persecution. As the war unfolded, Capa went to photograph different parts of the European Theatre. As a war photographer, he was the only “enemy alien” photographer for the Allied Powers. In 1943, Capa went to Sicily alongside the US troops and captured images of the sufferings of the Sicilian population under the German bombing, and progressed to capture their happiness when the American soldiers arrived to liberate them. The most notable in this lot is a picture of a Sicilian peasant pointing in the direction in which the German troops had gone. Covering the Omaha Beach war, Capa produced his most famous images – known and renowned as the Magnificent Eleven, all comprising photographs from the D-Day. Capa went along with the first wave of American troops to Omaha Beach, and captured images as the troops faced heavy resistance from German troops from the bunkers of the Atlantikwall. In all, the 106 photos he captured of the event travelled back with him to London – but only eleven survived. What Capa’s photography stands for today – besides the fact that it preserves the memories of a bygone era where the worst side of humanity came to fore – is the cutting style of capturing images. Capa, if one may so wish to imagine, was not about following the hackneyed approach of waiting for the right moment – but rather, one to pursue every available moment from behind the lens. In the process, his images were natural – and the candour inspires a sense of being able to relate to the images and the story they tell.